I get the occasional opportunity to preach at our church, Elim Evangelical Free in Puyallup, WA, which I enjoy (even though it is an incredible amount of work and makes me appreciate our pastors all the more!). Last weekend our lead pastor was vacationing in Nevada and Utah so he permitted me to preach on a topic of my choosing. I chose Genesis 8:18-22 (the story of Noah's magnificent act of worship and sacrifice, after deboarding the Ark) and the topic of "worship" in general. If you are interested in hearing the result, you can listen here (click on "Genesis 8:18-22" under the October 14, 2012 “Special Sermons” listing ... it's an MP3 about 37 minutes in length). As I was preparing for last weekend's sermon, I focused on four components of worship: fear, gratitude, praise, and sacrifice. I touched on a fifth (obedience), but as I've reflected more these past few days, I have become convicted that I didn't do it justice. Genesis 22:1-14 tells a story that is dramatic and beautiful, yet difficult. It even causes a lot of people to doubt the character of God. In it, God instructs Abraham to kill his only son Isaac on the altar of sacrifice. The very first verse in this story reveals that God was testing Abraham, testing his utter obedience. Abraham had come to know God well. God had provided Isaac miraculously, in faithfulness to His promise. Isaac was God's provision, His miracle, and Abraham knew it well. So when he was commanded to sacrifice what God had provided ... his only son, which he loved above even his own life ... would he obey? Thankfully, Scripture records that Abraham did obey. His obedience was proof of his faith. 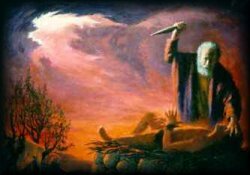 And you know the story: At the last possible moment, as the knife was raised to plunge into Isaac's heart as he lay there, bound upon the wood of the altar, God's command came again and stayed Abraham's hand. Then he provided a ram, whose horns were caught in a nearby thicket, as a sacrifice instead. These passages challenge me in the same way that Noah's sacrifice challenged me. God may, but is not necessarily, calling us to sacrifice in big ways, as much as He is calling us to sacrifice in the small ways of everyday living: To yield our time, our treasure, our talent, our energy to Him in ways that will bring glory to His name. Likewise, we may never experience a huge test of obedience, as Abraham did; yet we are called daily to obey in a thousand small ways: To refrain from gossip, to tell the truth, to love our neighbor as ourselves, to keep our hearts pure, to be kind, to share His love with others, to be a cheerful giver as He has prospered us. In Christ's parable of the talents in Matthew 25:14-28, in verse 23 the master of the faithful servant assures him: “You have been faithful with a few things; I will put you in charge of many things.” Obedience starts small! 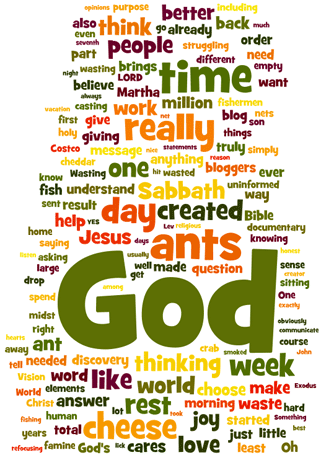 Sometimes the Bible relies heavily on words whose meaning has shifted dramatically in our language. For instance: "Our God is a jealous God." We attach a highly negative connotation to the word jealous because our cultural context for the word brings up images of jilted lovers, striking out in petulant anger. Hence our image of a "jealous God" may be one who is mad, spiteful and and vindictive because he isn't getting 100% of our attention. However, a much more accurate perspective on the word might be conjured up by the image of a mother walking beside her toddler down a busy street. With cars whizzing carelessly by just scant feet away, that mother is going to be very vigilant that her child does not dart out into the street. She is going to be jealous for her toddler. We wouldn't normally use the word "jealous" in this context, because its use in our language has shifted away from that. But that's really a much more accurate portrayal of how and why God is jealous for us. He loves us and longs to see us happy and fulfilled. He knows that the further we stray from His ways, the more likely we are to encounter danger and be crushed. He is jealous for us. Note that Jesus replaced the word "fear" with "worship." Not that Jesus shied from using the word "fear." In Matthew 10:28 He advises us: "Do not fear those who kill the body but are unable to kill the soul; but rather fear Him who is able to destroy both soul and body in hell" I used to think this verse meant that I should tiptoe carefully around God lest I make Him mad and get whacked for it. But the truth is that my sin has already given God all the justification He needs to destroy both my body and my soul in hell. True biblical fear is realizing that God loves me so much that He died so that I wouldn't have to go to hell and be destroyed! A God who would (and did) do that for me is awesomely, scarily, inconceivably merciful. That kind of mercy is way beyond human experience. I tremble and fear when I think about it. I think the 10 leprous men represent all of us who have come to the end of our ropes and have cried out to God to help us. We're all diseased and leprous, and sick with sin. Christ's response? He heals them all with a word. So I think these 10 healed lepers represent forgiven Christendom. And nine of the 10 skip merrily on their way without so much as a thank-you. No gratitude, no praise, no worship. Just one returns to fall at the master's feet and worship. Just one thanks God for paying the price! So what does Jesus say to this one? "Stand up and go, your faith has made you well." Wait a minute ... weren't all 10 healed? Yes, they were. Weren't all 10 therefore "well?" No, just the one who exhibited the faith to worship God could truly be pronounced "well." So obviously, therefore, there is more to being "well" than simply being forgiven of our sin. In order to be truly well, we must be more than forgiven: We must demonstrate the faith to worship God. The prophet Ezekiel, in chapters 1 and 2 of his book, falls down on his face "like a dead man" when confronted with the approach of the Holy God. The Apostle John does the exact same kind of faceplant in Revelation 1. What is God's response to this display of fear? In Isaiah 6 he takes a coal from the altar and applies it to Isaiah's lips. Suddenly Isaiah is purified and can speak boldly. In Ezekiel, it says the Holy Spirit "lifted him to his feet." Similarly, in Revelation 1 John reports that Christ put His right hand on him and said: "Do not be afraid!" So, the conclusion is: We are to fear God ... but not to be afraid! In fact, over and over again, He reassures us: "Do not be afraid! Stand!" Our basis for standing is obviously not any merit of our own. We are cleansed lepers. We can stand because we have been cleansed.